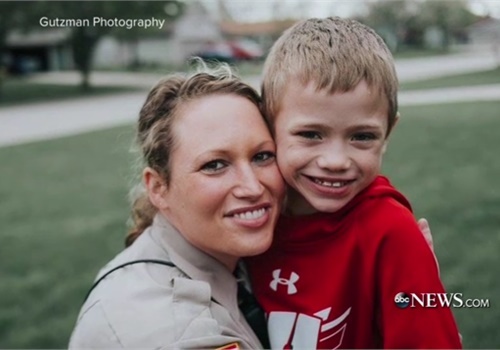 Officer Lindsey Bittorf of the Milton (WI) Police Department saw Kristi Goll's Facebook post seeking a live kidney donor for her 8-year-old son Jackson Arneson, who was born with a kidney condition. Bittorf said she was compelled to get tested to see whether she was a match. She was a perfect match, and nearly a year later the donation has been a success, reports WSBTV. Bittorf, who did not know the family, delivered the news that she would be a donor to Jackson in person. "I took an oath to serve and protect our community," Bittorf told him, "and now my kidney is going to serve and protect you." Jackson's June 22 transplant went smoothly, but he suffered collapsed lungs and pneumonia after the surgery. Thankfully, he pulled through after spending 11 days at the University of Wisconsin Hospital in Madison. "Thank you for giving me a new kidney ... I'm so lucky to have you as my donor," he told Bittorf via video. Even though Jackson, now 9, has known Officer Bittorf for less than a year, they are like family now, with the scars to prove it. Jackson even calls Bittorf his "other mom."